Meat Pies | Om nom nom! It seems like only yesterday that we went to London and Brussels, but it has been three years! Time really flies. To celebrate, we had a weekend of food we enjoyed there, from pubs around here with lovely Belgian and English beers on tap, to mussels and frites, baked beans (Shawn loves a full English breakfast 🙂 ), and finally meat pies. I won’t lie, I actually got the idea to make them to go with Shawn’s awesome beans when I picked up our Harry Potter cookbook and saw, “Molly Weasley’s meat pies.” How could I resist that? Coupled with the fact that Shawn had been wanting to make them for a while made it a no-brainer to give them a shot. We made two hand pies, a traditional beef and onion British pie, and a Tourtiere, which is a French-Canadian pork meat pie. We preferred the beef, but the pork was good too and with some adjustment (more gravy – it was a bit dry) would be excellent. 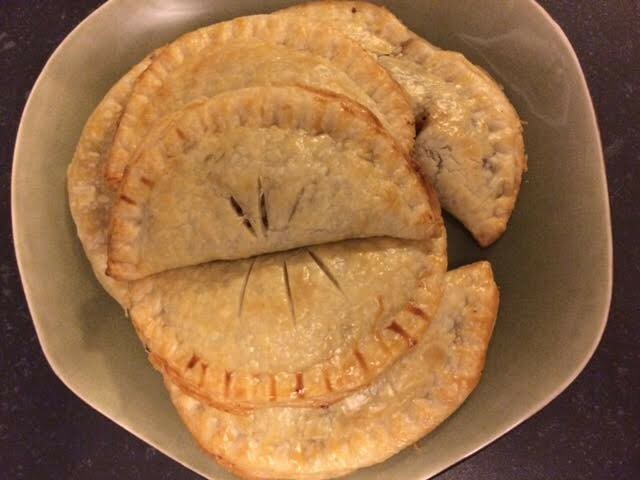 These were a lot of fun, and if you make hand pies, you will have plenty to freeze for later! I used store bought crust for this. My pie crust is nothing to write home about, so it was a safer option given the investment of time. We used two sizes, a 6″ cutout and a 4″ cutout. The 6″ took about a 1/3 of a cup of filling each and the 4″ a couple of tablespoons. You could just as easily make one large double-crusted pie. I used an egg yolk wash on the pie crusts to get the finish – one egg yolk and a dash of water beaten together, brushed lightly over the crust. It helps seal the crust and also adds some gloss. Peel and finely chop the onions, carrots and celery. Remove the rosemary leaves from the stalks and finely chop. Put a large pan over high heat and add dash of olive oil, all the chopped veggies, rosemary and bay leaves. Stir every minute for about 10 minutes, or until the veggies are softened and lightly colored. Stir in the ground beef and break up any large pieces. Add the mustard, a pinch of salt, Worcestershire sauce and 2 t. of flour. Turn the heat down, put a lid on, and simmer for about an hour. Make sure you stir it every so often. If at the end of the cook time the mixture is too soupy you can either thicken it with a little flour or use a slotted spoon to get the meat mixture out without any excess liquid. Fill pie or hand pie cutouts and bake according to pie crust directions. In a large, heavy frying pan, over medium heat, add pork and water, and heat to boiling point. Add onion, celery, pepper, savory, rosemary, nutmeg and cinnamon. Cook, covered, over low heat for one and a half hours, adding more liquid if the mixture dries out. Even if it looks like it is not dry, I would continue to add – after baking, this was the dry pie, whereas the beef and onion (which had an excess of gravy) was a perfect consistency. If you do have to add excess liquid, make sure to taste and up the herbs and seasonings to match. When the mixture is ready, season with salt to taste. Stir in rolled oats and cook, stirring, for two to five minutes. Fill pie or hand pies and bake according to pie crust directions.